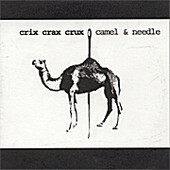 This August Jacksonville, Florida's Frigital Records released the second full-length from indie/lo-fi outfit Crix Crax Crux, entitled Camel & Needle. I didn't know what to expect when I first popped this into the CD player. No idea, really, which makes a review that much more challenging. At this point I hadn't heard anything about the label, except a friend of mine who keeps championing another Frigital band, Birdie Hilltop. But I never listened. For whatever reason I thought Crix Crax Crux would be some boring nu-metal band, I guess because they hail from the same town as Limp Bizkit. I'm sure even Crix Crax Crux would forgive me for being a little wary with this unfortunate coincidence starring me down. After shrugging off my initial impulse to yank it out of the CD player, my good conscious told me to leave it in. Even so, it still unfairly had only a small chance to impress my cynical ears. But now a couple of weeks removed, I'm glad I did because this album has been spinning over and over in my bedroom, living room, and car ever since. To my pleasant surprise it turns out that the band is minimalist lo-fi/dreamy bedroom pop, bearing no resemblance whatsoever to any other North Florida predecessor. While perhaps not rewriting the book on indie/lo-fi recording, Crix Crax Crux nevertheless accomplish what so many other indie-rockers fail in doing: that is, to make an album so complex in style yet with the feel that the album was made in a day. Isn't that the whole idea with lo-fi recording anyway? You know, cool without even trying (another indie band in the same vein, Spoon, seems to pull this off as well). Such seamlessness is what makes Camel & Needle stick whereas countless other indie hopefuls don't. Led by singer/guitarist Ben Crix, Crix Crax Crux recorded the follow-up to the cult-hit, but almost impossible to find, Chamisso Preis solely on analog technology, harkening back to early nineties lo-fi magicians such as Lou Barlow and Yo La Tengo. Consequently, the album sounds rough, which admittedly may turn-off some listeners immediately. However, those adventurous enough to look beyond the lack of studio gleam will be rewarded for their patience. At first lulled by fuzzed guitars, lush vocals, and streamlined live drum samples on the first track "not at all", the album initially gives the impression of being is awash in a dust cloud of indecipherable ethereality, shall I say a "dirtier" Monster Movie, or another similar neo-shoegaze band. But soon the album begins to emerge to full-form out of its haze of neo-shoegaze ruminations, revealing well-constructed pop gem after pop gem. Take the third track, "to the birds of the limb", for instance, whose Richard Hell-esque vocals combine with taut post-punk guitar riffs to create nothing short of a 4-minute indie-rock masterpiece. The next track, "Get Fooled (Again)" is a full-fledged rocker that reminds of Berlin-era Bowie mixed in with a little Spoon with its pulsating bass and engagingly off-kilter vocals. At this point, the lo-fi warmth of the production quality only served to bring me endearingly closer to an intimacy that is hard to find on any album. On "Thru the Gates" Crix Crax Crux show another side of their aesthetic with a mellow dronescape that would even have Yo La Tengo impressed. But I must say that this is confusing in that Crix Crax Crux traverse through genre after genre, from shoegaze to post-punk to 70's Bowie/Eno rock, making it hard to pinpoint where Crix Crax Crux is coming from, at least from a reviewer's standpoint. I honestly still don't know where to categorize them. And then suddenly, as if I you're caught in mid-thought, the album ends after a short 35 minute jaunt, just when you're really getting into it. Too bad. I can't listen to it for a long while. It's the kind of record you just can't figure out after a first listen. Such is also the case with the label itself, Frigital Records, which prides itself in its minimalist packaging and "black, white, and grey aesthetic". This no-frills approach seems to go hand in hand with Crix Crax Crux, who've forsaken studio frills for bedroom warmth with ease. I must say, any album that overcomes my initial impulse not to like it has earned my highest respect. One time through, Crix Crax Crux can be simultaneously bewildering and difficult. Yet once you reach its crux, Camel & Needle's impact may surprise you: not since Pavement's Westing (By Musket and Sextant) has indie lo-fi seemed so ingenious and more importantly, new. Perhaps I was wrong. Maybe Crix Crax Crux really is rewriting the book on indie lo-fi recording.